The increasing importance of business process management forces enterprises to support their business processes at an operational level. Therefore, the adoption of process-aware information systems (PAISs) is a highly relevant and hot topic for every enterprise. The development of work?ow patterns has become the most important factor for comparing different work?ow technologies and business process modeling languages. Apart of the great success of work?ow patterns in the academic area, vendors of work?ow technologies have also adopted the patterns for their products. Despite that scienti?c results about the usage of work?ow patterns in practice are still very scarce. This book presents the outcoming of a case study investigating the occurrence of work?ow patterns in real-world business processes. 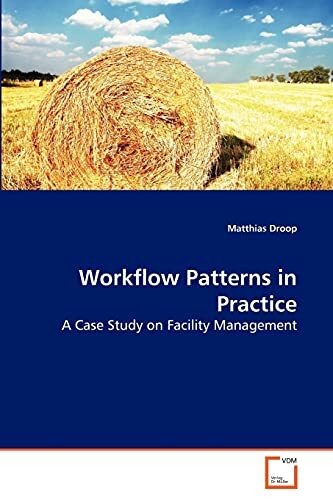 The context of the case study was con?ned to the occurrence of work?ow control-?ow patterns, service interaction patterns and work?ow activity patterns in the context of facility management. is Master in computer science at the University of Innsbruck. He is specialized in designing and implementing workflows and business processes into high quality software systems. He consulted a global operating enterprise in the field of process management. Currently he works in different projects implementing Just-In-Time workflows.